Turkish Delight for sale. Buy online at Zingerman's Mail Order. Gourmet Gifts. Food Gifts. C. S. Lewis' favorite sweet. I remember reading The Lion, The Witch, and the Wardrobe as a kid and being flabbergasted when Edmund gave up his siblings to the White Witch for plates of Turkish Delight. I’d never had Turkish Delight, but I figured it must taste amazing if a kid was willing to sell his family up the river just to have some. After tasting this confection from Turkey, I finally understand some of his motivation. Made with twice roasted pistachios from Gaziantep (a region in southern Turkey known for its excellent pistachios), sugar, water and starch, this confection is simple only on paper. Its flavor is ultra complex, dazzling, sweet and salty, layered in pistachio. Chewy, crunchy, nutty and sweet, you don’t have to make a deal with a witch to enjoy this traditional Turkish treat. Comes in a handsome blue tin. 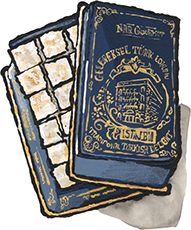 "Nar Gourmet’s nutty, salty-sweet version is the most bewitching real-life version [of Turkish delight] that we know. "